Why wait for summer to enjoy the flavour of sun-ripened peaches? 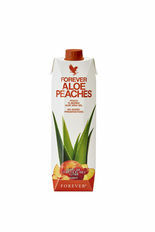 Now you can enjoy that peach taste any time with Forever Aloe Peaches, a smooth and fresh drink that’s enhanced 84.3% pure aloe vera gel with natural peach purée. Like all our aloe gels, this refreshing and fruity alternative is a brilliant digestive aid that’s high in vitamin C to help support immune function and skin health. Warning If you are pregnant, breastfeeding, planning pregnancy, taking any medications or are under medical supervision, please consult a doctor or healthcare professional before use.